Melvin Pender didn’t lace up his first pair of running shoes until he was 25 years old, while enlisted in the U.S. Army as a member of the 82nd Airborne Division. 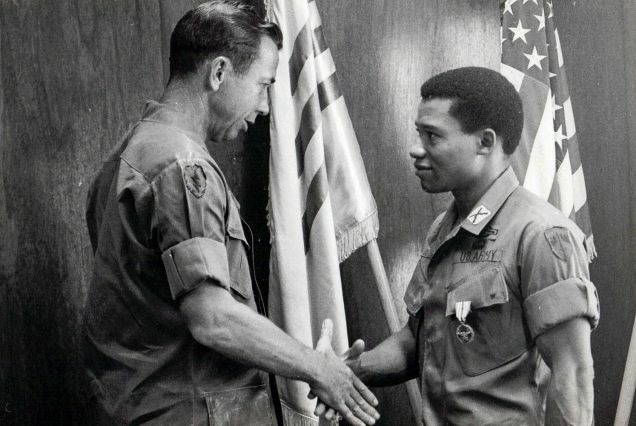 So when he got the call to compete in the 1968 Mexico City Olympics, it was a message he never had thought would come: at the time, Officer Pender was 31 years old and a platoon leader deployed in the jungles of Vietnam. Many records were shattered at the games, but it’s the Black Power salute made on the podium by Tommie Smith and John Carlos that captured the headlines. Pender was Carlos’ roommate at the games. At StoryCorps, Pender spoke with his friend Keith Sims about his experience at the Olympics. 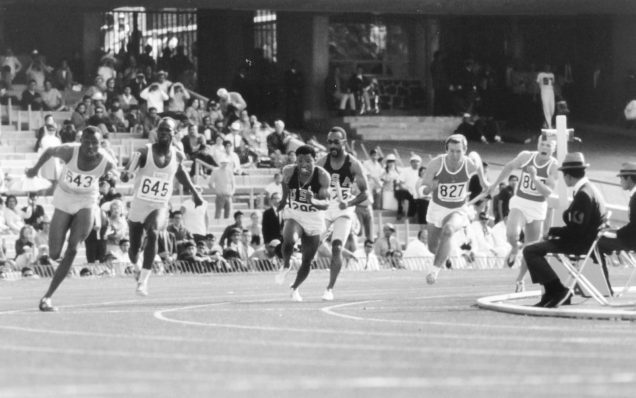 Melvin Pender ultimately won a gold medal in the 4 x 100 meter relay race in the 1968 Olympics. Soon after Mexico City, he was sent back to Vietnam, where he earned a bronze star for his service. He and John Carlos remain friends to this day. Top photo: Keith Sims and Melvin Pender pose at their StoryCorps interview in Atlanta, Georgia on September 13, 2018. Photo by Kelly Moffitt for StoryCorps. 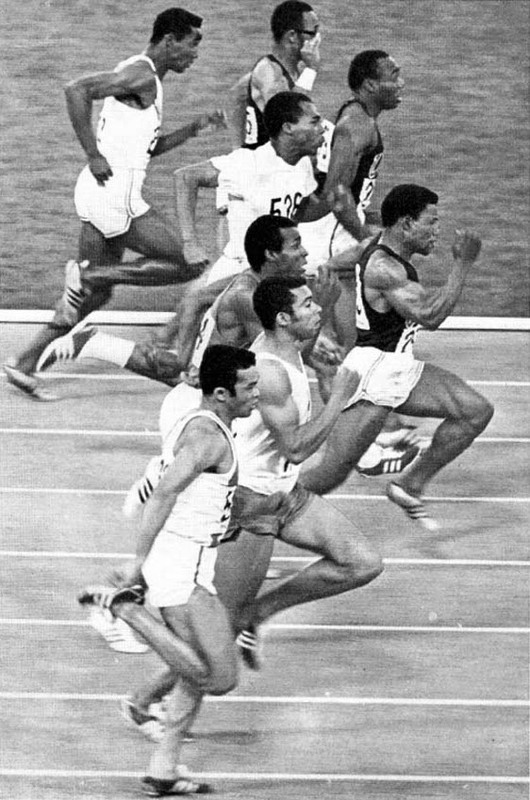 Second photo: Melvin Pender competes in the 100 meter race during the 1968 Mexico City Olympics. Here, he leads the group in the center. Courtesy Melvin and Debbie Pender. Third photo: Melvin Pender receives the hand-off in the 4 x 100 meter relay during the 1968 Olympics, for which he won a gold medal. Courtesy Melvin and Debbie Pender. Bottom photo: Melvin Pender receives a bronze star for his service in Vietnam on May 5, 1970. Courtesy Melvin and Debbie Pender. Originally aired October 12, 2018, on NPR’s Morning Edition. Melvin Pender (MP): I went to Vietnam with the ninth division. Straight to Mekong Delta. And things happen, you know. You couldn’t see the enemy; they were shooting at us from the jungles. And, uh, I had one of my kids killed. This young man died in my arms. How are you, how are you going to call someone ‘boy’? I mean, here I just got out of combat, seeing people die defending my country, and you’re going to call me a boy? They don’t make me boys like me. To be on the relay team, it was my time to shine. I ran my heart out. We ended up winning the race at a world record time of 38.2 seconds. Keith Sims (KS): A gold medal. KS: Now, John Carlos was your roommate. MP: Yes, Carlos was my roommate. When they was on that victor stand with the black glove, the black socks, no shoes, and bowing they head. KS: How did it make you feel? KS: When you saw that? They was not trying to disgrace the national anthem of America. What was happening was wrong. They were trying to show the world. ’Hey, we are human beings. We are human.’ That changed my life.